On the eve of war in September 1939, the British government planned to evacuate millions of children, teachers and vulnerable adults from the cities most in danger of Nazi aerial bombing to live with strangers in the countryside and overseas. While many children found peace and happiness in their temporary homes during the Blitz, for some the path to safety was fraught with danger. As Luftwaffe planes threatened from above, and Hitler amassed his forces across the English Channel, the need to evacuate became increasingly urgent. Children in the urban areas deemed highly likely to be attacked were moved to safety. Most evacuated children stayed in Britain and were simply moved from the city to the countryside (the exact fate that befell Peter, Susan, Edmund and Lucy in the Lion the Witch and the Wardrobe, at least before they entered Narnia). Some in Britain suggested to send children by sea to the Commonwealth countries, but this idea was rejected by the Parliament, because many – including Winston Churchill – thought that it was a defeatist move and was too dangerous. But that didn't stop families with connections in Canada, Australia, New Zealand and the United States privately sending their children overseas. The United States was hesitant to create a public program to accept these so-called "Seavacuees" because of America's neutral status in the war at that time and America's strict immigration laws. Many American businesses, however, did arrange for the children of their British employees to be privately brought to the United States. Eventually, thanks to humanitarian lobbying, the United States Committee for the Care of European Children was established in the summer of 1940, and brought over 800 children to the U.S. 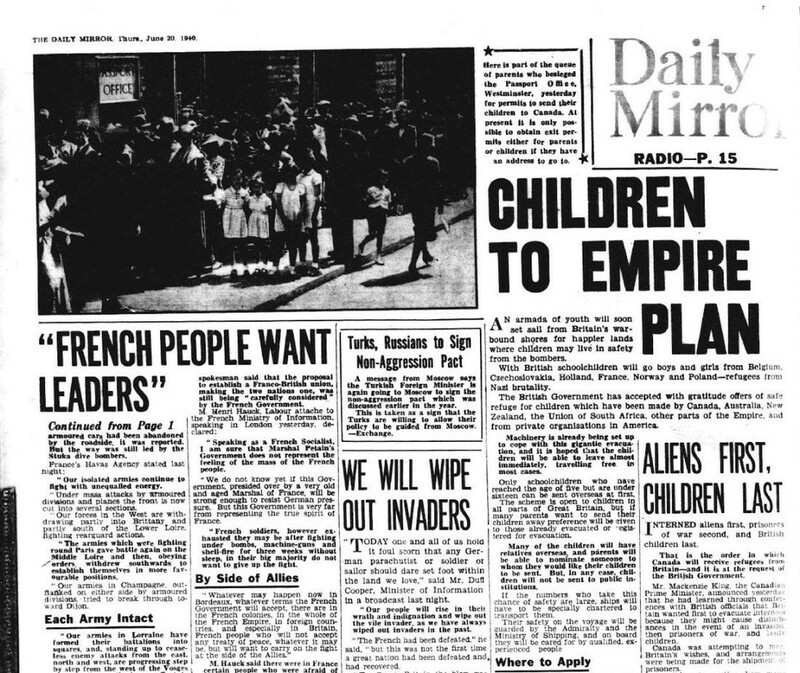 The Daily Mirror – June 4 1940 Image © THE BRITISH LIBRARY BOARD. ALL RIGHTS RESERVED. Across the pond, the mass evacuation of children by sea was once again proposed in June of 1940, and this time British Parliament approved. So the mass evacuations began, and the Children's Overseas Reception Board (CORB) was instituted to help them find suitable placements overseas. CORB received over 200,000 applications shortly after the program was announced, but because so many ships were being used for shipping war materiel, not many were able to transport passengers and evacuees. CORB accommodated as many children as they could but in the end, would wind up transporting only 2,664 children in nine trips over three months. Disaster was narrowly averted on August 30th, 1940 when a ship destined for Halifax and New York, carrying 320 "Seavacuees" was torpedoed by a Nazi U-boat. Incredibly, all the children aboard the SS Volendam survived, but the incident caused many to question the safety of sending children into such dangerous waters. 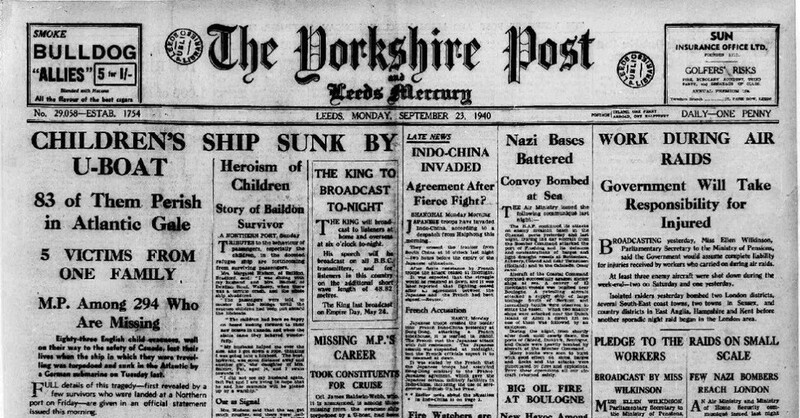 The Yorkshire Post and Leeds Mercury – Monday September 21 1940 Image © THE BRITISH LIBRARY BOARD. ALL RIGHTS RESERVED. Less than one month later, disaster struck again – and this time it was tragic. On September 17th 1940, the SS City of Benares, bound for Montreal, was torpedoed by a U-boat and sank. Over 250 people were killed, and 77 out of the 90 children aboard the ship lost their lives. The cold night and stormy conditions contributed to the high death toll, which caused instant outrage in Britain when reported. The Nazis claimed they did not know who was aboard the ship, and that it was reckless to send children into such peril – and the British public agreed. Citizens and newspapers became highly critical of the program, which was soon suspended because of the SS City of Benares disaster. Fortunately, in May 1941, the Germans moved their focus away from the bombing of British cities, and the need to evacuate children overseas diminished. Although private evacuations continued through 1941, mass public efforts to move children to the States and Canada ended with the City of Benares tragedy. Some of those who travelled across the Atlantic to seek safety during the chaos of war settled in the States. Did your family relocate during World War 2? Why not explore our Passenger Lists and Newspaper Archive to search for your family's 'Seavacuee'?